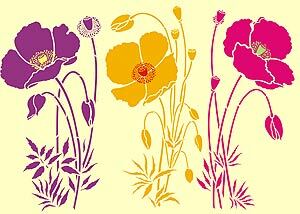 The Wild Poppies Theme Pack captures the magic of these beautiful wild poppy flowers. 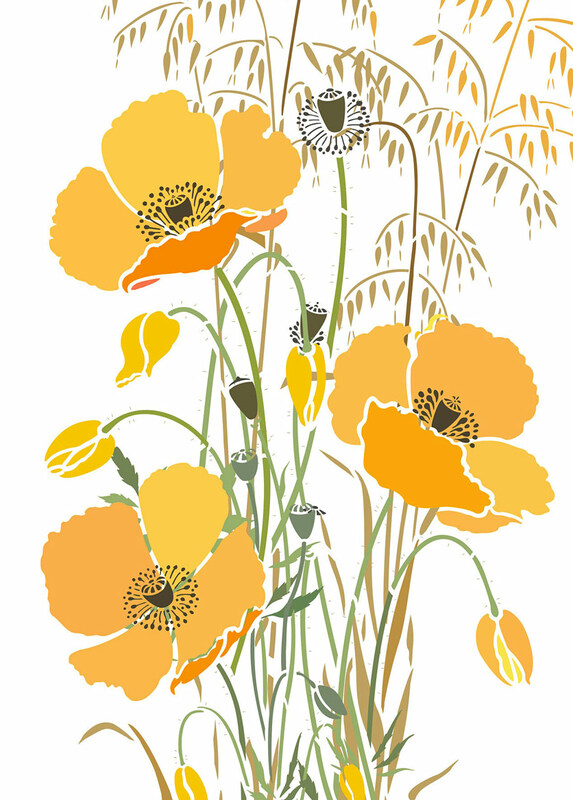 This theme pack comprises three graceful, delicate poppy motifs, with soft full blown flowers, buds, leaves, seed pods and intricate stamens – developed from Henny’s original summer meadow drawings of wild poppies. 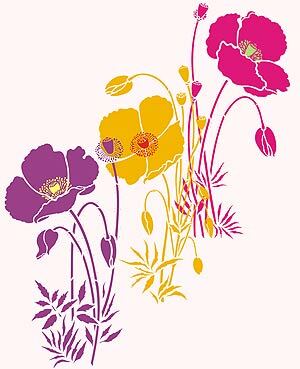 Stencil in true to life wild poppy colours, or in bright colours for contemporary poppy fun, or silhouette style for elegant feature statements. 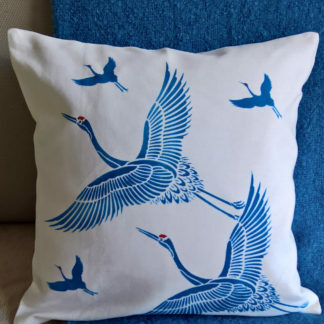 This design is beautiful stencilled on fabrics or all sorts and as wall features in rows or in clustered groupings. Try with our stunning Grasses Range to create that full summer meadow ambience. See the size and layout specifications below. 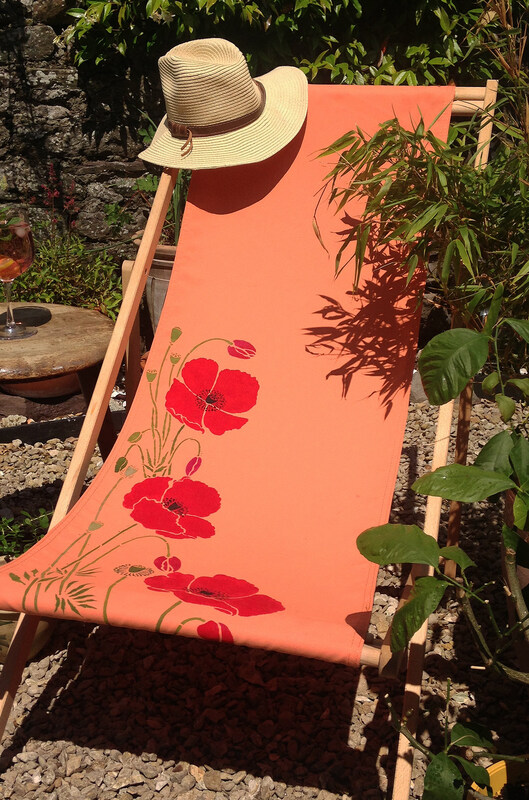 Above top – the three poppy motifs of the Wild Poppies Theme Pack add immediate impact to this canvas deckchair. Stencilled in Strawberry Red, Olive Green, Leaf Green and True Back Fabric Paints – an amazing transformation! 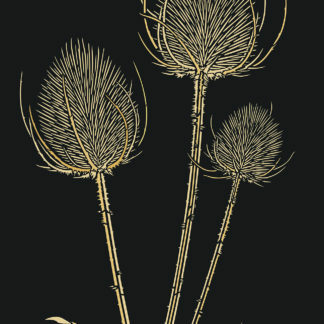 Or try stencilling in Welsh poppy colours combined with the Large Wild Slender Oats Stencil in Evening Primrose and Harvest Gold Stencil Paint (flowers, buds), Hedgerow, Woodland and Eucalyptus Stencil Paint (leaves, stems, small buds), Jet Black Stencil Paints (seed pods and stamens) and Grassland, Latte and Harvest Gold (Wild Slender Oats). Above – one motif of the Wild Poppies Theme Pack in the same red and greens as before with the Large Wild Oat Grass Stencil and Large Wild Rye Grass Stencil – lightly stencilled in Grassland (background) and more strongly in Latte (foreground). 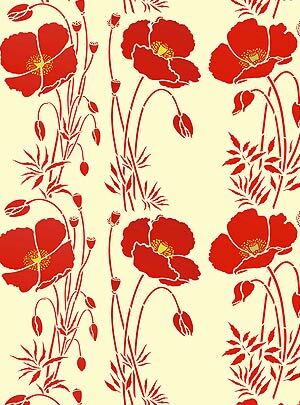 Above – a bright, contemporary theme – the three motifs of the Wild Poppies Theme Pack with flowers and leaves of each motif stencilled in the same colour, varying colour from motif to motif. Stencil paints used from top right Cerise Stencil Paint, with stamens in Spring Vine Stencil Paint; middle Harvest Gold Stencil Paint with stamens in Very Berry Stencil Paint; bottom in Indian Purple Stencil Paint with stamens in Evening Primrose. 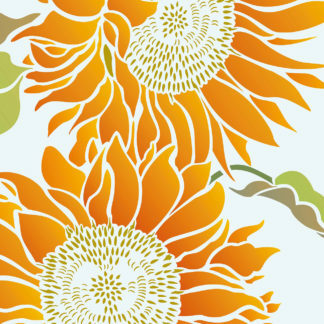 Below the same colours are used with flowers in a different arrangement on a pale yellow background. 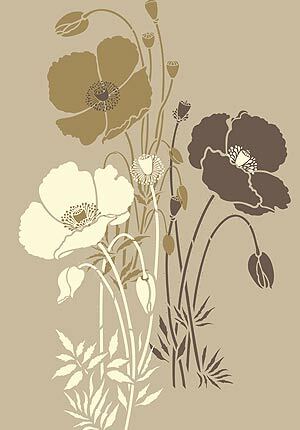 Above – the three motifs of the Poppies Theme Pack stencilled on an off white background in Very Berry (flowers and buds), Hedgerow Stencil Paint (leaves, stems, seed pods), and Jet Black Stencil Paints (stamens and seed pods). 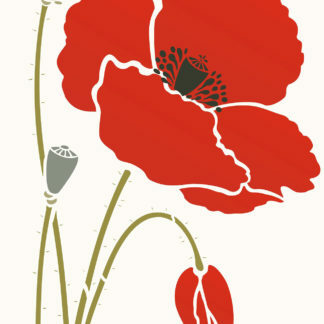 Above – the three motifs of the Poppies Theme Pack arranged in a group with the first stencil repeated, stencilled in the natural poppy colours of Very Berry (flowers and buds), Hedgerow, Verbena (leaves and stems) Stencil Paint and Jet Black Stencil Paint (stamens and seed pods) – on a pale blue background. 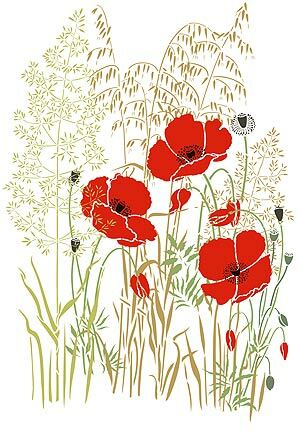 Above – the three motifs of the Poppies Theme Pack stencilled with the Large Wild Meadow Grass Stencil and Large Wild Slender Oats Stencil to create a meadow-like feel. Stencilled in Very Berry Stencil Paints (flowers and buds), with leaves and stems in Hedgerow, seed pods in Eucalyptus Stencil Paint and stamens in Jet Black, with wild grasses in Grassland and Latte Stencil Paints. 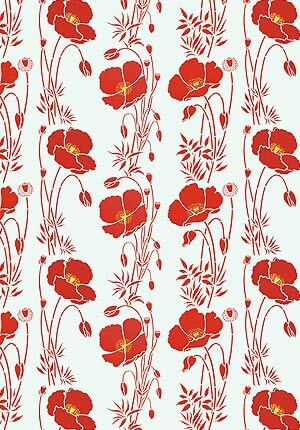 Above – the three motifs of the Poppies Theme Pack Stencil repeated in vertical columns – you can vary the height of each flower in each column, but repeat the same flower at the same level every three columns, so you create a pattern repeat. Stencilled in a simple striking colour scheme on a pale blue background – in Very Berry with stamens in Harvest Gold Stencil Paint. 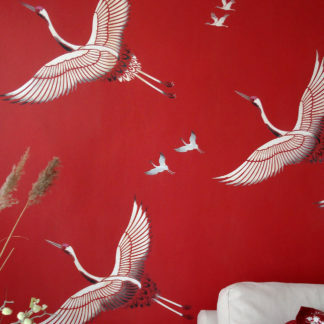 Use this style to create stunningly beautiful effects on both walls and fabric. An equally impressive finish can be created using gloss varnish on a matt dark painted surfaces for subtle, sophisticated effects. 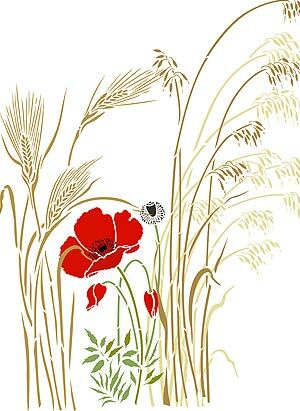 Above – the three motifs of the Poppies Theme Pack stencilled in Harvest Gold Stencil Paint with stamens in Very Berry Stencil Paint (flowers). 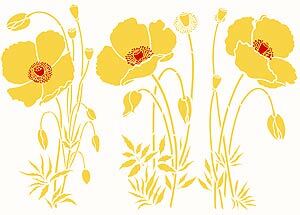 Above – the three motifs of the Poppies Theme Pack stencilled repeated in horizontal rows on a warm yellow background in Very Berry with stamens in Harvest Gold Stencil Paint. 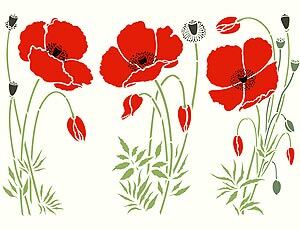 Above – the three motifs of the Poppies Theme Pack stencilled in vertical columns to create an impressive Border. Stencilled in Vanilla and Latte Stencil Paint, blended on the stencil using Stencil Sponges. 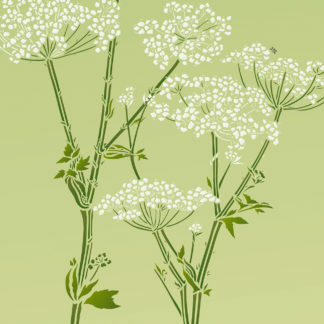 Stamens are stencilled in the same Chinese red colour as the background to create uniformity. 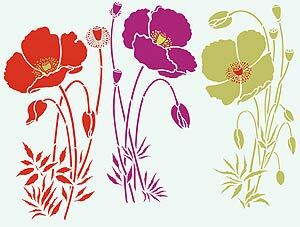 Above – the Poppies Theme Pack stencilled in an overlapping arrangement to create interest and depth. Stencilled first in Mocha and Coffee Bean Stencil Paint (back top poppy), and then in Coffee Bean and Nougat Stencil Paint (middle right) and then in Nougat and Mocha Stencil Paint (front) on a pale coffee coloured background. Using lighter and darker tones than the wall colour is always an effective way to create a tone-on-tone colour palette with real depth. 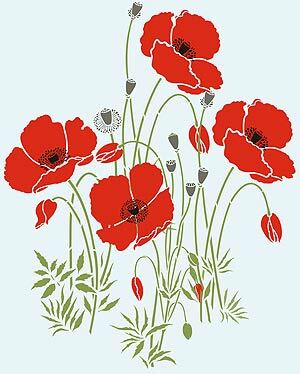 Easy to use one layer stencil on three sheets – the Wild Poppies Theme Pack comprises 3 poppy motifs with additional stamen details for applying on top of flower designs (bottom right hand side of each motif on the sheet). 1. Flower One (left below). Overall motif up to 43cm (17″) tall x 19cm (7 1/2″) wide. Flower diameter up to 18cm (7″) on diagonal. 2. 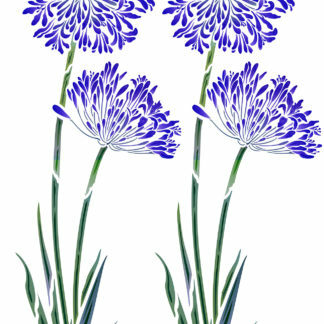 Flower Two (middle below). 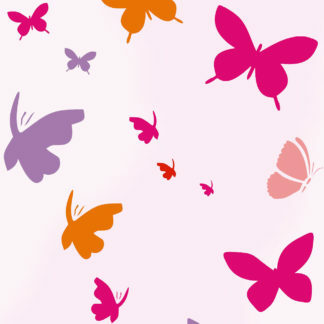 Overall motif up to 41cm (16″) tall x 23cm (9″) wide. Flower diameter up to 18cm (7″) on diagonal. 3. Flower Three (right below). Overall motif up to 43cm (17″) tall x 19cm (7 1/2″) wide. Flower diameter up to 17cm (6 3/4″) on diagonal. Sheet sizes all 28cm (11″) wide x 50cm (19 3/4″) tall. 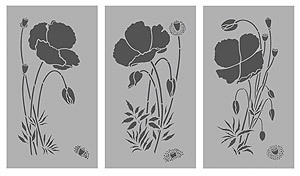 Left – layout of the Wild Poppies Theme Pack 3 Sheet Option – shows the three flower motifs and stamen details for stencilling on top of flower motifs.